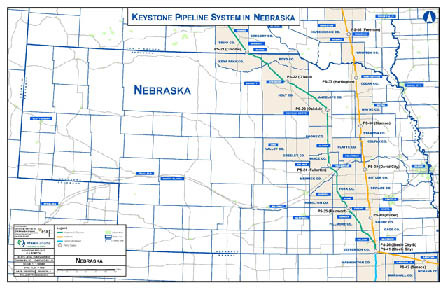 TransCanada Corp. has submitted a new permit application to the Nebraska Public Service Commission for its controversial Keystone XL oil pipeline. The proposed 275-mile route across Nebraska would be the same as the one approved in 2013 by the Nebraska Department of Environmental Quality, passing through Antelope, Boone and Nance counties. TransCanada filed its new application on Feb. 17. The PSC review could take up to a year. The state’s pipeline controversy is expected to continue in the coming months, with Bold Nebraska and a number of landowners opposing the venture. As part of the process, TransCanada has also filed eminent domain proceedings for portions of the route where it was unable to reach agreement with landowners. Several of those filings are in Boone County. The company has stated it has reached agreement with about 90 percent of landowners along the pipeline route. In January, TransCanada renewed its Keystone XL application with the U.S. State Department, just two days after President Donald Trump signed an executive action to speed the approval process for both the Keystone XL and Dakota Access Pipelines. More details in the Feb. 22 Albion News Print and E-editions.